I remember when we started to share opinions about the B737NG new mould, a lot of posts, impressions, opinions, comments and then Herpa offered us a good mould. Now Herpa announced the B737 MAX, "8" and "9" version, a completely new mould according to latest infos. lack of "pointy" tail cone. The main, exterior differences among the B737-800WL or W (winglets or scimitar winglets) and the B737 MAX8 are: winglets, bigger and larger engines, stretched landing gear, "pointy" tail cone section. The MAX winglets are different from the "classic" B737-700/800/900ER winglets and from the scimitars; the CFM LEAP-1B engine has a diameter of 176 cm, 19 cm larger than CFM56-7B used by the B737NG: this means that, to leave the usual 43 cm from the engine and the ground, the MAX landing gear has been stretched of 20 cm. Exteriorly the two engines differs because the LEAP has some slots on the rear part. Even the tail cone section is different: pointy on the MAX. B737 MAX8: lenght 39.5 meters; wings span 35.9 meters; engines diameter 1.76 meters. For 1:500 scale models the lenght and the wings span is the same, but the mould must be different because of the pointy tail cone of the MAX. Now, we are talking of 0.5 mm, half a millimeter but, if the mould must be almost perfect, the different engine of the MAX must be represented in the new mould. About the landing gear, the extra 20 cm of the MAX are 0.04 mm, about half a millimeter even for the landing gear. Yes, we are talking of measures under the millimeter but with 2019 technology i imagine Herpa is able to represent these differences on the new mould. These are the pics of the B737 MAX8 and B737 MAX9 moulds released by Herpa (i will post them tomorrow because they are too big). We can see the winglets, the slots on the engines, the pointy tail cone. Impossible to understand if the engines are larger and the landing gear stretched. 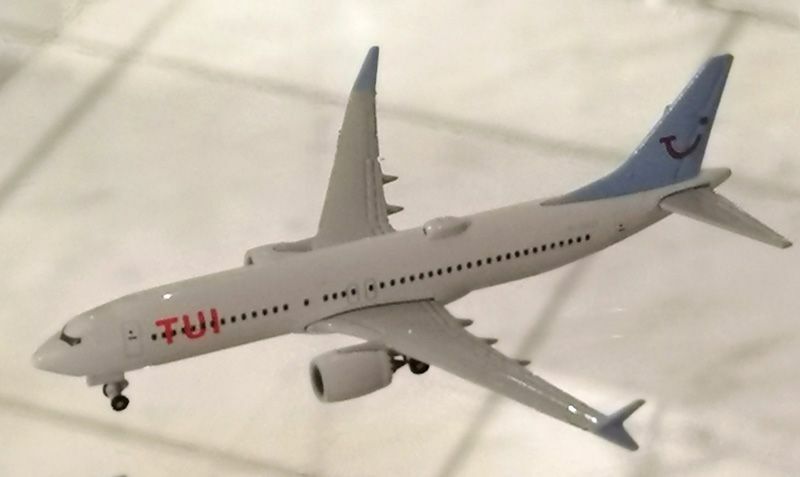 I hope to receive soon TUIfly Deutschland B737 MAX8 and United B737 MAX9 so we can check the models. Last edited by Charter; 04-14-2019 at 04:15 PM. Re: Herpa B737 MAX mould. 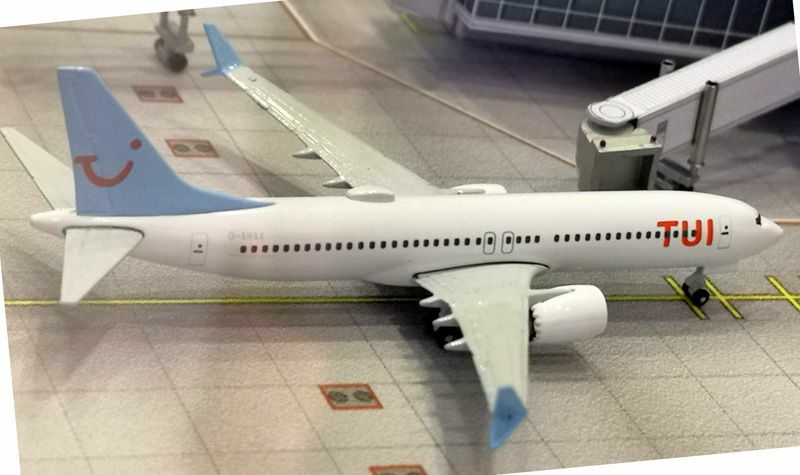 This is just a B737-800 mold with MAX wings, and I strongly doubt this will be the production version. Last edited by LeoMuse747; 04-14-2019 at 10:22 PM. While the engine diamater is probably to similar to tell just from a picture, their rear end has a different "rippled" shape, similar to what's used on a B787. So the new engines are also already on that sample. Probably the modified fuselage itself (which DOES exist, as the pictures taken by Peter Vosen at the Toy Fair show!) wasn't ready enough for a production sample for whatever reason. Quite interesting, that box on top (does anybody know, what that is?) seams not to exist on those MAX 8 already delivered to other TUIfly Airlines. However it exists on some 737-800 (like the Norwegian annouced for 05/06 2019). Last edited by bruno.lima; 04-15-2019 at 05:32 AM. Pointy tailcone, slots on the LEAP engine, different winglets, wi-fi dome...just to understand how the engines diameter is. Whats Herpas problem with too small Cockpit-Windows and too large nosegears lately? Not just the nosegear! Herpa is having too much trouble with gear lengths lately.